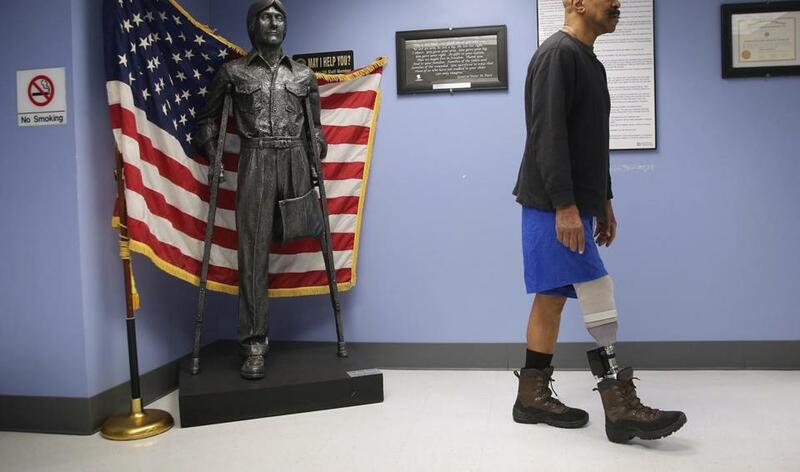 A US military veteran had his prosthetic leg serviced at a VA hospital in New York in 2014. US hospitals stand to benefit financially from the privatization of the Veterans Health Administration and are no fans of the nation’s largest and only publicly funded health care system. Many of their top executives and physicians want our tax dollars diverted to them, instead of paying for the dedicated, salaried caregivers who specialize in veterans care at the VHA. Dr. Cary W. Akins (“Keeping a promise to veterans,” Opinion, Sept. 1) promotes an outsourcing scheme that would benefit private-sector hospitals such as Massachusetts General. Akins seizes on fixable VHA problems, such as those in Manchester, N.H., reported by the Globe, to urge dismantling a system with a record of patient safety, quality of care, and accountability that is every bit as good as that of private hospitals, if not better. Studies document that these hospitals are not prepared to meet the needs of 9 million patients with complex military-service-related conditions. The cost of outsourced care would exceed care delivered at VHA. Privatization, opposed by a majority of veterans, is not the way to fulfill our “promise to veterans.” Strengthening and improving the VHA is a far better path. The consequences of closing Veterans Health Administration hospitals, as proposed by Dr. Cary W. Akins in “Keeping a promise to veterans,” would be disastrous for sick veterans. I know. I am one of them. Three and a half years ago, I suffered a catastrophic spinal cord injury. I was initially sent to a non-VA rehabilitation hospital. After seven weeks, my insurance ran out and I was discharged. The nature of my injury qualified me for VA health care at the VA hospital in West Roxbury. There money was never an issue. The only issue was my recovery. According to a recent study published in the Journal of the American Medical Association, VA hospitals outperform non-VA hospitals on many important safety and quality indicators. Taking this into account, the proposal to close down inpatient care would amount to providing sick veterans with diminished care so that homeless veterans can have a place to sleep. In my case I have no doubt that that would have consigned me to a hospital bed for the rest of my life. Talk about turning one group against another under the guise of humanitarian care for all. The harsh fact is that we need to fund both. As veterans, we appreciated the Globe’s highlighting a national health concern: homeless veterans. However, Dr. Cary W. Akins’s op-ed “Keeping a promise to veterans,” which advocates moving veterans’ inpatient care to community hospitals and converting VA beds to housing for homeless veterans, misses the mark on several counts. The articles and statistics he cites to buttress the policy recommendations are weak. For example, Akins states that the VA spends more money per patient than is spent on the general population of the United States. That makes sense, because veterans make up a clinically significant population different from the general population, which includes a healthy subset. The VA patient pool is a sick population of wounded warriors with long-term health problems. Akins also notes that veterans stay longer in the hospital. Well, of course they do, given the significance of their health issues. At the same time, Akins fails to demonstrate that VA hospitals, veterans, or the public would benefit from the warehousing of the homeless in hospitals. Can he cite even one article demonstrating that the homeless should live in hospitals, which are active incubators of antibiotic-resistant organisms waiting to infect the long-term patient? The illnesses veterans suffer are an extraordinary challenge to the health profession. This is self-evident. Our warrior heroes suffer from addictions, post-traumatic stress disorder, diabetes, heart conditions, mental illness, and physical injuries. Are community hospitals proven competent to integrate such extensive patient-centric care? We argue that they are not. Until science and epidemiology prove otherwise, we reject Akins’s recommendation, most particularly the warehousing of the homeless. The writers serve on the executive committee of the Smedley D. Butler Brigade, Chapter 9, of Veterans for Peace. Morris has a master’s degree in international health policy from the Harvard T. H. Chan School of Public Health.